One look at the impressive stone-covered tower of Vizcaya, and you'll feel as though you've been magically transported to the European countryside. In true Mediterranean form, this home reflects a lifestyle that embraces breathtaking views, good company and quiet surroundings. That's thanks to the vision of builder Don Hempel of Issa Homes, who drew his inspiration from the Old World architecture of Coral Gables, Florida, and its landmark historic villa, Vizcaya. "The original Vizcaya represents a time when so many great homes of America were inspired by the lavish palaces of Europe," Hempel remarked. "This new namesake at Golden Oak conveys an elegant feeling respectful of both that storied past and the present, with grand dimensions and classic details." In the modern-day Vizcaya at Golden Oak, each living space seeks to maximize the stunning views from the home's preserve-view lot by means of a carefully considered floorplan. "We fell in love with this homesite when looking at the possibility to capture a view from every bedroom," Hempel added. "The privacy of the over-sized outdoor living area, spa and pool overlooking the nature preserve makes this home extra special, from the inside out." Perhaps the home's most dramatic feature is its spiral staircase leading to the second-floor junior master suite and two en-suite guest bedrooms. The curved staircase allows for a generous amount of natural light to flood the loft area and abundantly proportioned great room below. Vizcaya's artfully designed kitchen is equipped with chef's quality appliances, a glass mosaic accent wall and a large center island perfect for family gatherings and neighborly conversation. Polished marble stonework, themed embellishments and a private owner's suite add to the impressive feeling of the home, while transitional elements include a light color palette, geometric millwork with natural wood accents, and smart home features. 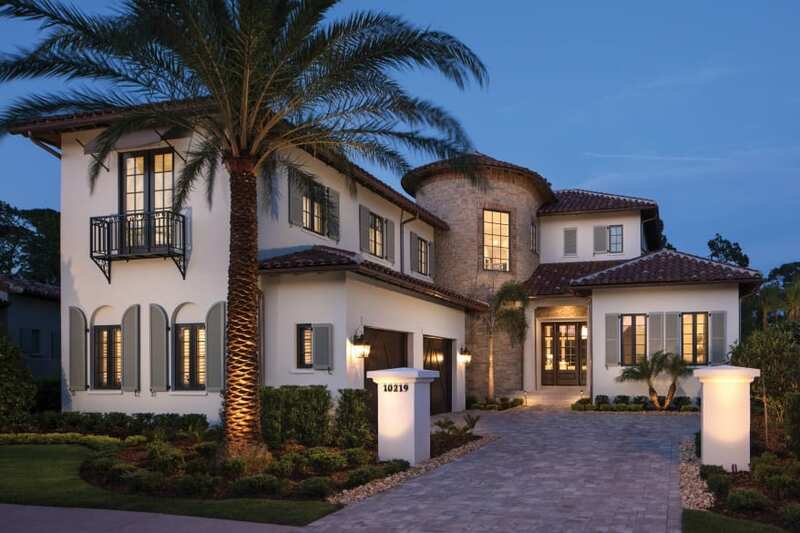 "By juxtaposing classical architecture with the modern elements of a coastal retreat," Hempel pointed out, "we've created a home that not only lives up to the beauty of the Vizcaya name, but captures the essence of the Golden Oak community." For more details about available homes in Golden Oak, explore the Home Availability section of our website.